(COVINGTON, La.) As the St. Paul’s basketball team eyes down the upcoming start to their 2017-2018 season, senior Devonte Allen knows that this season will be his last wearing the blue and gold. The road leading up to his senior season has been filled with hardships and triumphs that molded him into a young man cherished by his peers and coaches. 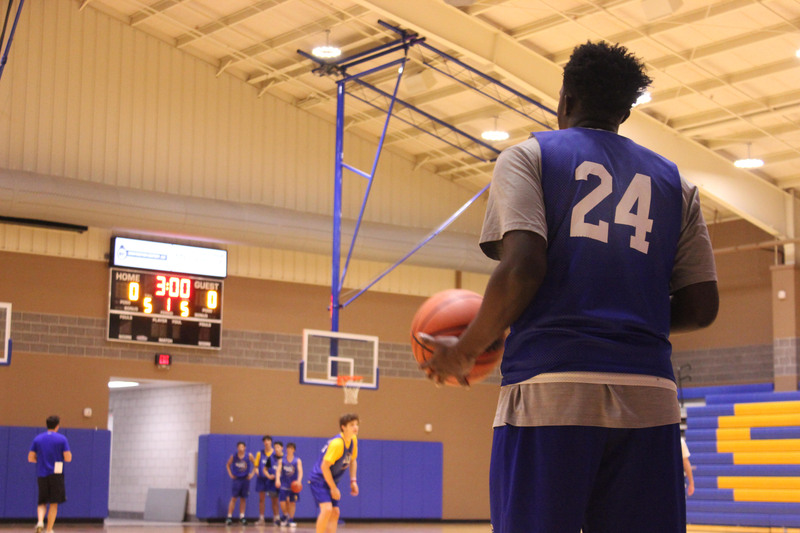 Devonte began his tenure at SPS as a freshman, so needless to say, all eyes were locked on the 6’5″, spiky-haired newcomer on the first day of the school in August of 2014. He was no stranger to being a stranger. He moved to Louisiana from Hensley, Arkansas, in third grade with his mother and two sisters, Kamille (11) and Lauren (8), and had to quickly adapt to a new life. Devonte attended both Magnolia Trace Elementary and Mandeville Middle School, and then onto Monteleone Junior High for seventh and eighth grade. He grew into an extremely talented athlete during his time at Monteleone, playing both basketball and football. His Monteleone basketball squad took home two district titles in the two seasons that Devonte played there. He was all set to attend Lakeshore High School after his year at Monteleone, but fate had something else in store. Brett Edwards, the father of another SPS class of 2018 basketball player, Parker Edwards, noticed Devonte in a summer league game playing for Lakeshore. Edwards introduced him to former SPS head coach Phil Williams, and the rest, as they say, is history. Devonte’s skills on the court are only part of his venerated reputation at SPS. His personality, character, and humility are noticed by many of his coaches and peers. When asked about his motivation to succeed on and off the court, his answer reflected not only his character, but also the value he places on family. “My motivation really comes from my sisters because they look up to me the most. People always say their mom, but my sisters really look up to me, and I just want to take care of them,” Devonte said. Anyone who knows Devonte is probably aware of the confusion surrounding his last name. Devonte’s birth surname is Allen, and after the move from Arkansas to Louisiana, he decided to change his name to Devonte Person-Allen, adding his step-dad’s last name to his own. However, he prefers the name Devonte Allen for school and basketball announcements. Devonte hopes to play in college after his senior year at SPS. Currently, he is being actively recruited by Centenary College and has had some interest from Southeastern University. He is hoping to gain the interest of even better programs during his final season with SPS. The Wolves’ first game, and Devonte’s last season opener, is set Tuesday, Nov 14, across the lake against the Edna Karr Cougars. This game will mark the beginning of the Wolves’ campaign for a deep playoff run and a third straight district title. Great article. Go devonte! Go Wolves! great article, this story touched my heart as it will others I am sure.